Poet Spencer Reece will be reading from his forthcoming collection of poems, The Road to Emmaus, at Richard Hugo House on Monday, March 25. The title poem recently appeared in Best American Poetry 2012, edited by Mark Doty. The evening will include a screening of James Franco’s short film based on Reece’s poem, “The Clerk’s Tale.” Spencer Reece will also discuss his work at Our Little Roses orphanage for girls in Honduras, where he is currently spending a Fulbright Year. James Franco is producing a documentary about Reece’s work with the girls writing and illustrating poetry. This event is free and is supported by Poets & Writers, Humanities WA, and ArtsWA. Children, teens and adults are invited to celebrate National Poetry Month and enter The Seattle Public Library’s first haiku contest. Write a haiku that celebrates the library in your life and submit it beginning Monday, March 4. Your haiku is due online before 5 p.m. Friday, March 15. Winning entries will appear on the Library website beginning April 1. For more information, go to www.spl.org/haiku. 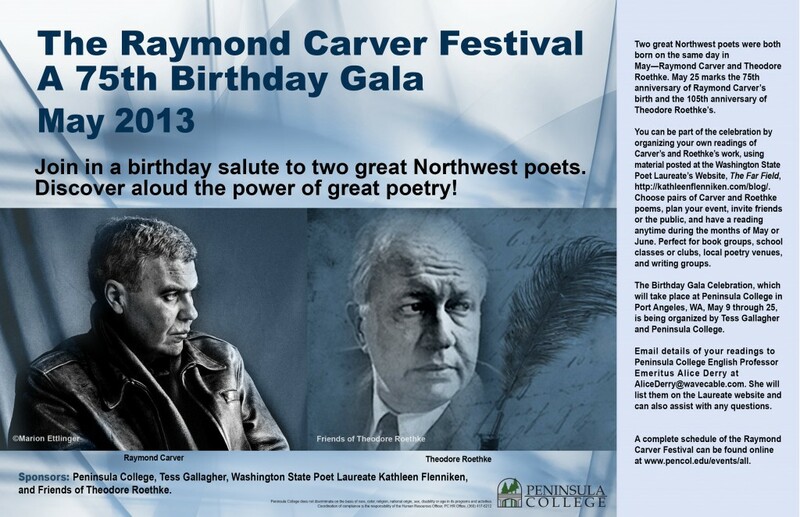 The Raymond Carver Festival will be celebrating the legendary author and poet’s 75th birthday in a series of events this spring in Port Angeles. You are invited to take part in your own community with programs for adults and children, schools, civic organizations, and libraries. Please note the “Carver/Roethke” button that has been added to The Far Field banner, above. There you will find resources to help you create a program around the poems of Washington’s own Raymond Carver, along with Theodore Roethke. Poet Tess Gallagher (Carver’s widow and a student of Roethke) and poet Alice Derry have secured permissions for poems by Carver and Roethke that you may download for reading, recitation, and discussion, and have designed lesson plans for high school students and elementary students. There is even a beautiful poster that you can download to help you publicize your event. Please help us spread the word about this marvelous opportunity! Jack Straw is accepting applications for the 2013 Jack Straw Writers Program until November 1. This year’s literary curator is Stephanie Kallos, who will select twelve writers to create new work during the residency. Selected participants will share their work through live readings, recorded interviews, a published anthology, and as podcasts on the Jack Straw website. Participants also receive professional training in voice and microphone technique, performance and delivery, and studio interviews. This program is open to writers of all genres willing to travel to the Seattle area for occasional performances and workshops. Jack Straw Alums include Cheryl Strayed, Matt Briggs, Doug Nufer, Kelli Russell Agodon, Cody Walker, John Olson, Frances McCue, Molly Tenenbaum, Kevin Craft, Wendy Call, Priscilla Long, Bill Carty, Nassim Assefi, and many more. The Floating Bridge Chapbook Competition opens for submissions on November 1 until February 15, 2013. Poets may submit manuscripts of up to 24 pages electronically. Only Washington State poets are eligible. The winner’s book is published in an edition of 400 books. The winner receives a reading in the Seattle area, $500 and fifteen copies of the book. The 2012 winner is Jodie Marion for Another Exile on the 45th Parallel. For submission guidelines, please visit the Floating Bridge Press website. READING: Jodie Marion will read from her award-winning chapbook, Another Exile on the 45th Parallel, and Dennis Caswell will read from his full-length collection, Phlogiston, at 7:00 at the U.W. branch of the University Bookstore on Tuesday, October 30. Both books are new from Floating Bridge Press. READING: Tess Gallagher, Richard Kenney, Jim Bertolino, Laurie Lamon, and Brian Culhane will read at Elliott Bay Books on Thursday, November 1 at 7:00 pm to mark the publication of the first paper edition of the Plume Anthology. Haiku in the Woods–FREE WORKSHOP! Victoria Ford, Holly Hughes, Jack McCarthy, Joannie Stangeland, and Joan Swift. Five poets read: Sharon Hashimoto, Donald Kentop, Belle Randall, Michael Spence, and Richard Wakefield. Contact David D. Horowitz, rosealleypress@juno.com. The Seattle Poetry Slam will hold its annual Grand Slam competition (an all ages event) at Town Hall on Friday, April 27that 7:30 pm.The Grand Slam will feature Women of the World Poetry Slam finalist Airea “Dee” Matthews. Note: This is an all ages event. Town Hall Great Hall; enter on 8th Avenue. Seattle’s coolest orchestra and the city’s most beloved poets join forces for an epic evening of collaborative mayhem: First, poets Roberto Ascalon, Derrick Brown, Elaina M. Ellis, Karen Finneyfrock, Tara Hardy, Soulchilde/Okanomode, and Buddy Wakefield explore the heartaches and hopes of an uncertain world with an uncertain future, backed by an original orchestral score. Then, the Seattle Rock Orchestra performs an apocalypse-themed song-cycle based on the poets’ collective libretto, featuring soprano Annie Jantzer and tenor Soulchilde/Okanomode. Presented Seattle Rock Orchestra and TumbleMe Productions. Advance tickets are $10-$18 at Brown Paper Tickets/$12-$18 at the door beginning at 7:30 pm. Call 206/427-3237 for more information. TACOMA—In honor of National Poetry Month, join 2010-11 Tacoma Poet Laureate Tammy Robacker and writer Maria Gudaitis with special guest poets, Tacoma Poet Laureate Josie Emmons Turner, Allen Braden, Elijah Muied and Hans Ostrom, as they read poems in response to “Hope in Hard Times: Washington During the Great Depression”—an exhibit at the Washington State History Museum. The event takes place Sunday, April 29, from 2 – 4 p.m. Admission to the event is $6 per person. At 2 p.m., the public will be invited to enjoy an exhibition briefing, a gallery walk through of the show, a break with refreshments provided by Anthem Coffee and Tea, and admission to the special poetry reading at 3 p.m. in the Auditorium. All proceeds go to the Washington State History Museum, a non-profit organization located at 1911 Pacific Ave., Tacoma, 98402; 253.272.3500. Guests are also invited to join the poets at a post-event poetry party from 4 – 6 p.m. at Anthem Coffee and Tea (right next door to the Museum). Reading & CD release party: APRIL 20TH, FRIDAY, 7 P.M.
JACK STRAW STUDIO, 4261 Roosevelt Way N.E. Anna Balint: discussing/reading the work of poet, visual artist, social justice and environmental activist Rafael Jesus Gonzalez. These adult writing workshops offer instruction, practice, and feedback in a variety of genres, plus some tips on the business of writing (pitching, publishing, and promoting your work) and feature local literary luminaries (Robert Horton, Jen Graves, Jonathan Evison, Elizabeth Austen)–as well as those on tour (Ruth Ozeki, Davy Rothbart, among others)–and all the profits go to support the youth programming at 826 Seattle. April 4, 6:30-8:30pm – Match Coffee and Wine Bar, 15705 Main Street NE, Duvall, WA. April 5, 7pm – Café Zippy’s, 2811 Wetmore Avenue, Everett, WA. Kathleen Flenniken and Martha Collins: April 2, 7:00 at Elliott Bay Book Store, Seattle.